In a customer-facing sales environment – whether face-to-face, via the web, or both – Exo POS is easily configured to provide complete point-of-sale functionality. This means you can run your entire business, from end-to-end, on the same integrated system, with complete transactional visibility. Exo POS stock control capabilities translate to automatic updating of stock levels as sales are transacted, support of multiple warehouse sites, access to customer orders, delivery times and much more. 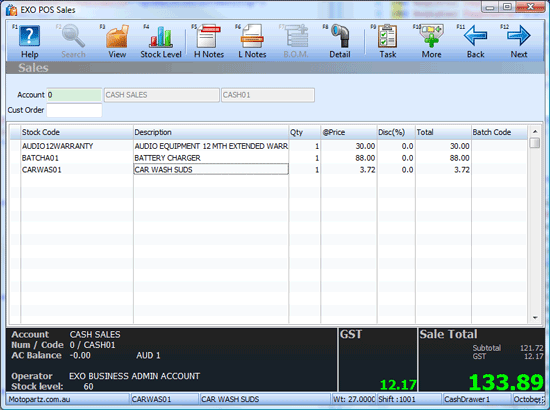 Combine all of this with an easy-to-use retail interface, a barcode reader, cash drawer, docket printer, EFTPOS, touch screen and other retail POS hardware integration and you can create a very powerful enterprise retail solution. Basically we’d just outgrown Premier. Because of Premier and EXO’s shared parent company, we knew we’d be able to integrate legacy and new data easily. And that was a big plus for us. Microsharp understood our needs to incorporate business processes into the system with their first-class knowledge of the product, rather than just transfer data to a database. For the moment, we’re running the two branches and it’s great to be able to share data across them. But if we decide to open a third or fourth in the future, we know that EXO can cope with that, and grow as we do. Knowing we can easily have a report written if it doesn’t already exist really is a comfort. In fact, it’s that extra functionality that makes MYOB our preferred choice of software. The net result is a business that’s getting maximum benefit from a well thought-through and implemented business management system – and a clear view of the critical processes that drive its success.